Our testing has shown the optimum core design is the 3/8” bar and plate style that has a 3/8” charge air and ambient air path, instead of the common 1/4” size. The PERRIN bar and plate core design is much more durable than tube and fin with the ability to withstand rocks and other debris, which may enter the scoop. 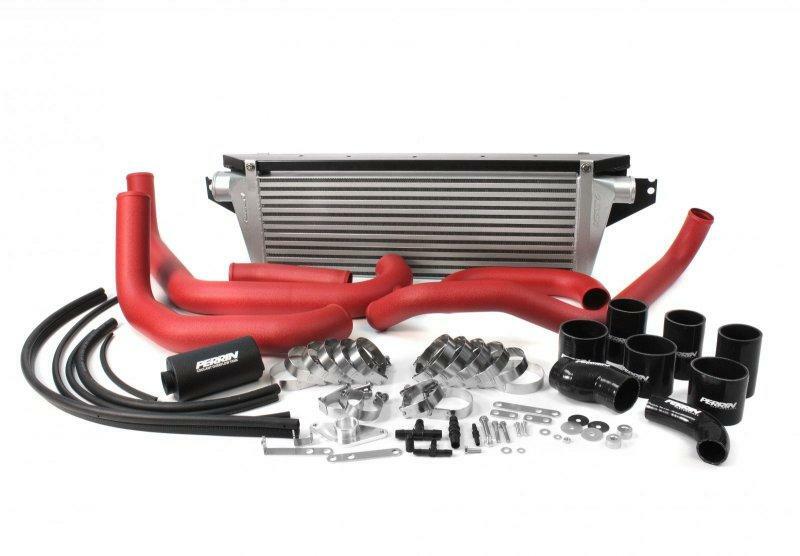 Right off the turbo a smooth offset coupler carries the hot side air charge to a perfectly matched 2.25” boost tube. We chose 2.25” tubing for a smoother, cleaner, obstruction free routing while still being large enough to flow more WHP than most turbos can put out. The air charge then is routed through the engine bay next to the battery, and down behind the radiator to the intercooler. The cold side boost tubes are mounted as high as possible in the engine compartment to clear all turbo and intake combinations as it travels to the throttle body through the engine bay. 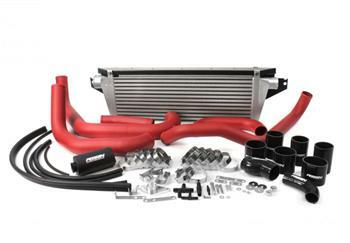 PERRIN Performance T-bolt clamps are standard on PERRIN intercoolers. They are designed for uniform clamping at all points around the band. The wider band distributes the force over a larger area and the fine threaded bolts with nylon lock nuts allow for accurate torque and proper clamping. Never worry about having to re-tighten down the road, plus each PERRIN logo-ed clamp is made in the USA and has the torque spec engraved on each one. Advantage PERRIN! Note: Coolant Reservoir not included with every Intercooler kit. Please confirm before ordering. PERRIN Performance is one of the only intercooler manufactures who pressure tests every intercooler. We pressurize every intercooler to 50 psi. on our special jigs.This ensures you never get a core with a leak! Even the slightest leak can cause your vehicle to loose power, literally bleeding turbo boost pressure out the intercooler.